I haven't even planted a pumpkin seed yet and I've already had my first two screw ups of the season. Both came in the form of the same compost manure. The first mistake is not to take a hard look at the amount of phosphorous being added when adding poultry compost to the soil. It actually is a common mistake to look at just the nitrogen levels (which I did) and ignore the phosphorous numbers going into the patch. High phosphorous shouldn't cause the pumpkin plant to much trouble but it probably will cause the myco to be less effective. 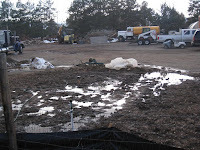 The second mistake is that high sodium levels were introduced into the patch with the poultry compost. My fall soil test showed very low sodium levels but the most recent soil test numbers showed the sodium levels through the roof. There is only one source that this much sodium could have come from and that is the poultry compost. I've learned recently that some chickens are given a high phosphorous and salt diet to keep malnutrition away and to plump up the chickens. Apparently that was the case for where my compost came from. I was told the compost was Class I compost but apparently that wasn't the case. The lesson learned is to know the source before it goes into the patch. 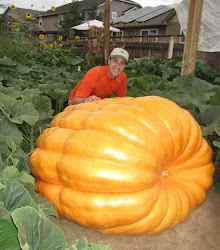 Joe Jutras had problems with his poultry compost last year too and he still grew a 1507 pound pumpkin. Hopefully I can do some things to fix at least the sodium problem. To get the sodium out of the soil I am adding 20lbs of gypsum and flooding the patch with water. Base on some tables from the Colorado Extension service I need about 6 hours of irrigation to flush out the sodium by about 50% in my clay soil. I started that process on one half of my patch yesterday. After everything has dried out I'm going to get another soil test done and see how much nitrogen, potassium and magnesium I need to put back into the patch because those amendments should be somewhat flushed out by the irrigation too.